Sula and Nel are two young black girls; clever and poor. They grow up together sharing their secrets, dreams and happiness. Then Sula breaks free from their small-town community in the uplands of Ohio to roam the cities of America. When she returns ten years later much has changed. Including Nel, who now has a husband and three children. The friendship between the two women becomes strained and the whole town grows wary as Sula continues in ther wayaward, vagabond and uncompromising ways. A very strange, but beautiful book about a friendship between two women. Sula is a very peculiar person, but I think that considering everything that has happened in her life, you can understand why she turned out the way she did. I can't wait until we analyse and discuss this one! I will reserve this book until after my lit. exam on the 19th of dec, and then I will turn it into a bookray. The bookray will start in early January 2007. A month is probably enough to read this book, since it is pretty short, only about 170 pages. It's a paperback and not very heavy. The last participant on the list can do what he or she wishes with the book. <-- Book is here travelling! Book arrived today, will start reading it shortly. Looking forward to it! # 349 on the list "1001 books you must read before you die". A rich and colorful story about friendship and shaping your own life. It's set in av peculiar village, where the inhabitants actually let each other have their own lives, even if they don't understand or approve. Will send it to Deepswamp today! The book have arrived, start reading at once. "Full of beuty, eccentricity, bustle, laughter, sensuality, generous affection..."
and try to understand the life of the people in Toni Morrisons book. Thanks for the upportunity to read this book! This book arrived on friday, but because I wasn't home, I had to wait until today before I could get it from the post office. I have really been looking forward to reading it so I began right away. I liked this book, but must say I wasn't really as moved by it as I've heard others have been. Will PM shimi for adress. 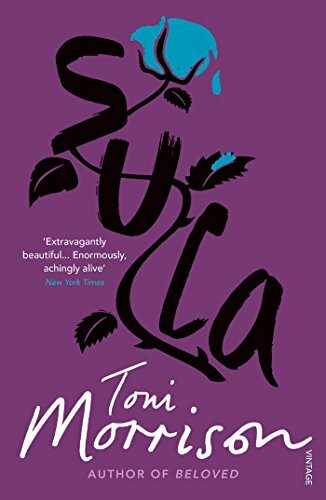 I've just finished reading Sula, and I must say that I liked this book a lot to begin with... it was beautifully written, and I really enjoyed the different world Toni Morrison introduced me to. However, I felt the book didn't have a lot of character development, and later in the book I didn't really care about the people in it. It was still an interesting read, and a book I'm glad to have read. LESEHEST wanted to be skipped, so I'm sending the book to sirah tomorrow, 22/3-07. The book arrived some days ago but due to the sad incident of my computer collapsing wasn´t able to make journal entry earlier. Thank you, Shimi for sending it and Yogie for starting the ray! A very odd story of a friendship. Somehow I liked it, somehow I didn´t. Anyway, Toni Morrison is a GREAT author! Next on the ring is Sobergirl but if you Yogie don´t mind I would first pass the book to Ahava who lives in my neighbourhood and then she´ll send it Sobergirl. Thanks again for letting me to join the ray! Ahava (from Sirah's neighbourhood :) got the book today, started it in the train on a way back home from a Helsinki get-together (isn't this the correct word?) and can't leave the story. This might be one of those "take-vacation-from-your-day-to-day-life-to-read-me" -books. Three months is far too long a time to keep a book in one's shelf. I'll send Sula to Sobergirl as soon as possible. I think she needs something else to think about these days. Toni Morrison is one of my all-time favourite writers, and this is a book I haven't read before. I have some books to read before this one (Purple Hibiscus, the new Harry Potter, and a Maya Angelou) but I don't think they will take a lot of time, after that I will start reading "Sula". I look very much forward to reading this! Thank you Ahava for sending me the book! A good read, eventhough not my favourite Morrison. My favourites are Beloved and Song of Solomon. Thanks yogie for arranging the bookray! I will send the book to the participant asap! The book arrived here today. Thanks for sending it, Sobergirl and the Finnish salmiakki were really a nice surprise. I''ve still got some other rings to read but will try to get to this one as soon as possible. This was a very fascinating and often also shocking story. Thanks to yogie for this ring and please excuse that it took me so long to read the book. I'll now ask for malagan's address so that the book can continue its journey. As malagan neither answered my PM's nor my forum postings, I asked for ekranda's address and the book is now on its way to the UK.